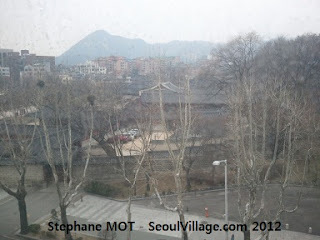 I took these two grainy pictures with my dumbphone, and didn't need Instagram to give them a sepia look: if GCS Int'l enjoy a fantastic view on downtown Seoul, and if they know how to host a seminar*, their windows need some washing. That's what I call a minor room for improvement. Just to help you locate GCS HQs on Yulgokno, this is their Northern view, from Gwonnong-dong: a section of Changdeokgung (east of Donhwamun, the palace's main gate), Bugaksan in the distance (the mountain), and the hills of Wonseo-dong in-between (Bukchon area, close to Gahoe-dong in the sketch). 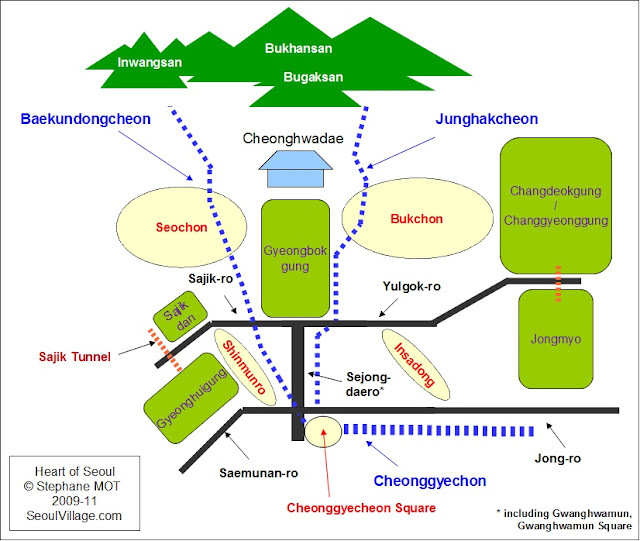 Here's a Northeastern view with the four lanes of Yulgokno heading for Wonnam-dong Sageori. You can make out the small footbridge connecting Jongmyo (right) with Changgyeonggung-Changdeokgung Palaces (left), and the working site with its sign advertising the "improvement of Yulgokno in front of Changdeokgung". From the start*, I applauded the project to reunite Jongmyo and Changdeokgung by covering a section of Yulgokno, but also wondered how the city would manage two more lanes of traffic, and if all impacts were carefully considered (cultural heritage, environment, bicycles, pedestrians...). Judging by this shot, we're at the stage where asphalt gains over green: the old and peaceful woods of Jongmyo have already shrunk to make room for two more lanes, or at least to divert the traffic during the process. The doubts remain: I wouldn't want this section of Yulgokno to become yet another dark tunnel, yet another repellent for humans and cyclists, yet another neighborhood sacrificed to Car Almighty. What would be the point of reconnecting North with South while disconnecting East from West? So let's keep an eye on this one. And if needed, let's summon the ghosts of Sulla-gil. Anyway, they too are watching. Yes, that's Seo Sulla-gil, the street starting right at the working site's gate. And if you want to learn more about that haunted 'patrol way', meet "Jongmyo Ghosts". 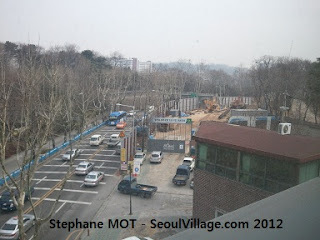 **see "Jongno-gu renovation (continued)", following "Jongmyo-Changdeokgung reunited"